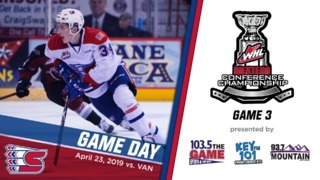 KENT, Wash. — The Spokane Chiefs battled back from a two-goal third period deficit to beat the division rival Seattle Thunderbirds in overtime on Tuesday night, 3-2. 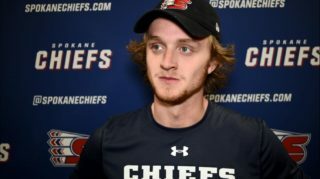 New Jersey Devils prospect Ty Smith was involved in all three Chiefs goals with a goal and two assists while netminder Dawson Weatherill kept Spokane in it with 37 saves. The first two periods were tightly contested at the ShoWare Center on Tuesday night, with both teams trading scoring chances. 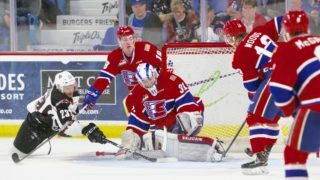 It was the hosting Thunderbirds who took advantage first, however, as rookie forward Payton Mount took advantage quick faceoff win to score his first career WHL goal at 3:36 of the first. Seattle made it 2-0 just over three minutes into the second period and goaltender Liam Hughes made multiple big saves to stymie the Chiefs through 40 minutes, despite Spokane leading 22-20 in shots on goal. Spokane finally broke through 7:05 into the third period as Smith fired a shot into traffic from the blue line, allowing Ethan McIndoe to pick up the rebound for his sixth goal of the season. The power play score extended the Chiefs’ streak to 13-straight games scoring a goal with the man advantage. It also extended Smith’s point streak to seven games; Smith has at least a point in 16 of 17 games played this season. Smith came through in the clutch with 3:55 left in regulation, as forward Eli Zummack found the streaking defenseman between the circles to chip in his third of the year and tie the game at 2-2, forcing overtime. 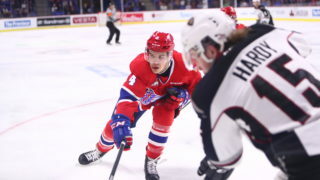 The comeback was complete 3:58 into the 3-on-3 overtime period as second-year forward Luke Toporowski fired a shot from the right circle that deflected off a stick and fooled Hughes, bouncing into the net to give Spokane the victory. The goal extended Toporowski’s goal streak to four games. The win was Spokane’s first of the year in games that required overtime or a shootout (1-0-1-2). Spokane finished 1-for-6 on the power play and 3-for-3 on the penalty kill. Seattle outshot the Chiefs 39-37. 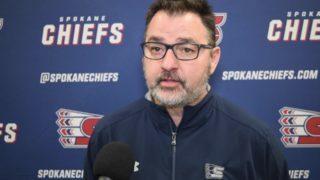 The Chiefs return home Friday night for a rematch against the Thunderbirds at Spokane Arena. It will be Coeur d’Alene Casino BINGO Night at the Arena as fans will have the opportunity to play in the area’s largest bingo game to win prizes courtesy of Coeur d’Alene Casino. They’ll then host the Calgary Hitmen on Saturday night for Fred Meyer Shop with the Chiefs Night as one lucky fan will walk away with a $1,000 shopping spree to Fred Meyer. Stick around after the game for the Fred Meyer Turkey Shoot as all the ladies in attendance will have the chance to shoot a puck for a free turkey! 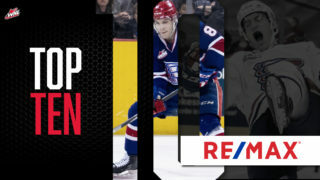 Tickets for Friday, Saturday and all Chiefs home games are available online here, over the phone at 509-535-PUCK and in-person at the Chiefs’ Ticket Office at Spokane Arena.